Are you looking to meet others and spend time with people that share your interests? Need a break from your workout and just want to be social and have fun? Then join us at Fleet Feet Sports Bloomington this summer for some fun evenings at the store! 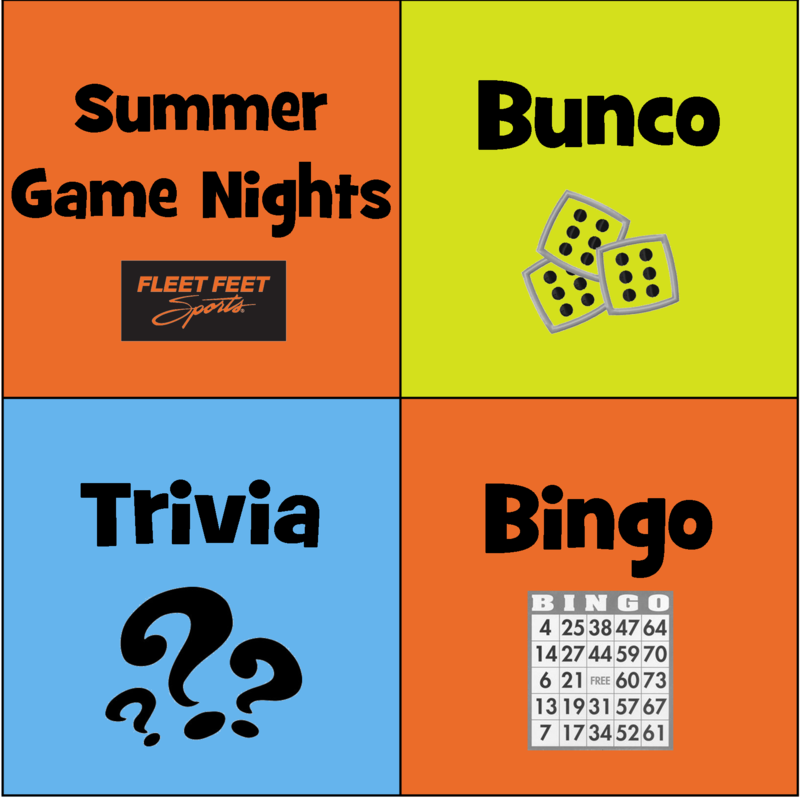 Thursday, June 19 @ 7:30 pm - Bunco Night for Ladies Only. Bunco is a parlor-style dice game. It's a fast moving game that involves changing tables so you get to meet and talk with everyone in attendance. Don't worry if you've never played before, it's easy to learn and we'll run through the rules before we start. Click here to sign up. Put a team of 2 - 4 people together - be sure to invite your smartest friends! We will have 8 rounds of trivia questions in categories that have to do with health, wellness, exercise and sports. Click here to sign up your team. We're going to take the traditional game and give it a Fleet Feet twist. Instead of numbers we'll be calling out items related to running! All events are for adults only. Fee is $5 to cover the cost of beverages and snacks. Prizes will be given to game winners each night. Space is limited - please sign up prior to each event and adjust your sign-up if you are unable to attend. Email julie@fleetfeetbloomington.com for more information or with any questions.